Welcome to our new Holiday Inn Express Crestwood hotel! We are conveniently located 9 miles South of Chicago Midway Airport MDW and 32 miles from Chicago OHare International Airport ORD . The Holiday Inn Express hotel in Crestwood is located just off I 294 and minutes away from I 57, I 90/I 94 and I 80.Begin your day with a complimentary cup of coffee and enjoy our hot breakfast featuring our signature cinnamon rolls and pancakes. 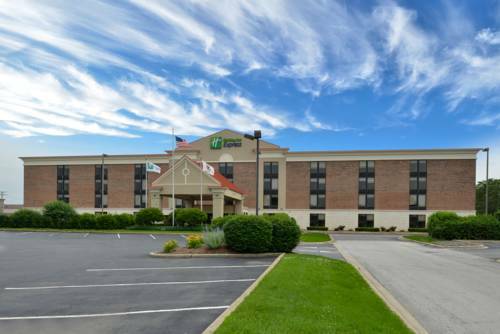 The Holiday Inn Express Crestwood hotel features 123 guestrooms and suites with free high speed Internet access throughout the hotel. Get energized in our brand new Fitness Center, with state of the art equipment and unwind in our indoor pool. Business Center and flexible meeting space are available to meet your needs.Whether for business or pleasure the Holiday Inn Express Crestwood hotel is the perfect choice! The hotel is surrounded by restaurants, shopping and nearby attractions such as Off Track Betting, Chicagoland Speedway, Hollywood Park Family Fun Center and Downtown Chicago! The Hotel is also nearby Advocate Christ Medical Center, Coca Cola, Honeywell, Future Mark Paper and Griffith Labs.Experience all that Chicago has to offer while staying with us at Holiday Inn Express Crestwood hotel. The El Rancho Motel, sadly (from our perspective) renamed the "River Trail Gardens and Inn" was a memorable location for the 1987 John Candy-Steve Martin comedy "Planes, Trains and Automobiles." Remember: those aren't pillows.